information about technical progress achieved during the project. 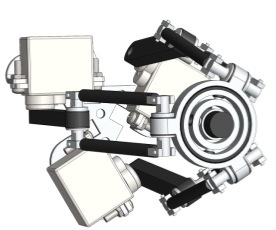 dynamical behavior of the system: the final modular ducted-fan prototype has been designed to achieve full-actuation of the longitudinal dynamics so as to improve the manipulation and physical interaction capabilities. 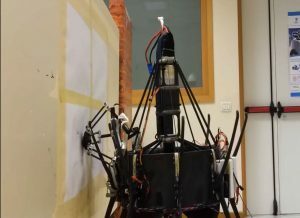 – To take advantage of such innovative features, suitable control and control allocation algorithms have been designed and tested in both free-flight and physical interaction scenarios aiming at simulating the experiments to be achieved on the final demo by means of the mockup. – During the 3rd IW, the experiments to be achieved with the modular ducted-fan prototype have been planned with all partners to show the effectiveness of the prototype in a real inspection scenarios employing the mockup environment. – The accuracy of the aerodynamic model of the final ducted-fan prototype has been updated to take into account for all the main aerodynamic effects measured on a load-cell. 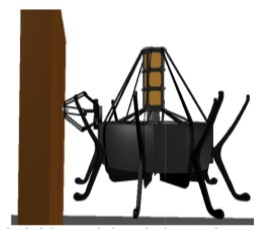 The dynamics of the final modular ducted-fan configuration has been included. 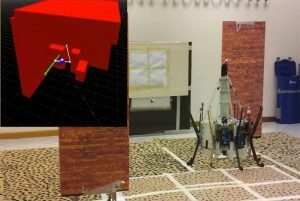 – Development and test of a wall identification module suitable to be employed by the high-level supervisory control for an autonomous wall inspection task. 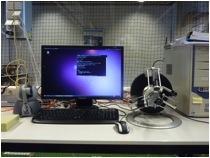 – Development and integration of a monocular visual odometry based on PTAM. 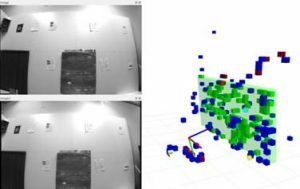 – Development of a dense environment reconstruction module based on a RGBD camera and integration with a monocular visual odometry. 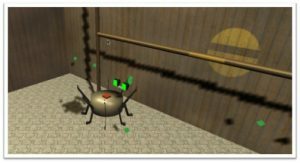 – Inclusion of motion trajectory for Aerial Manipulation in Primitive Supervisor. – Integration with High-level Supervisory control and lower levels as for Aerial Manipulator added functionalities. – Test of communication protocols for the activation of docking operative mode. 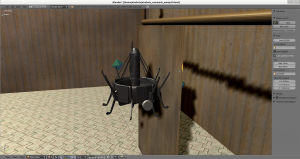 – Primitive supervisor now generates trajectories also keeping orientation tangent to assigned path for position. – The high-level and low-level supervisory system have been extended to monitor and control the areal manipulation activities. – We extended the high-level and low-level supervisory system in order to enable inspection and docking operations. The extended system was then tested in a simulated environment. 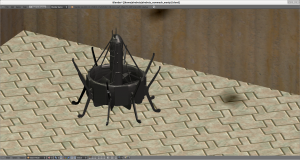 – During IW3 we integrated and tested the overall system in the ETH arena. 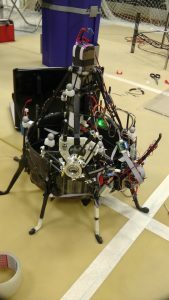 – We tested replanning and inspection tasks using the ETH quadrotor as a test-bed. 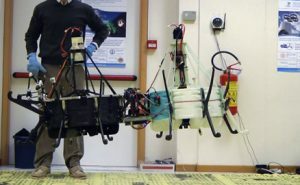 The areal manipulation system was implemented and tested on the Bologna robotic platform. – The meeting has focused on the theme of Unmanned Aerial Vehicles, with a specic attention to future scenarios related to the used technologies, possible civil applications and funding opportunities in future European programs. 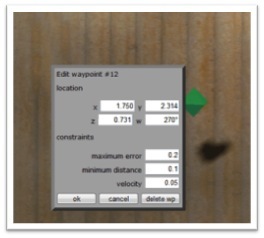 – Advanced version of the simulation software and environment with improved modeling of contacts and force sensors. – Improved integration with the low-level controller and flight tests. – Intensive flight tests integrating advanced low-level and high-level funtionalities. 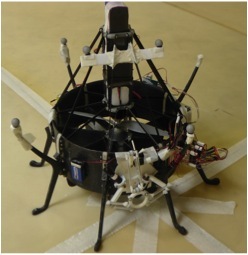 – Docking and aerial robotics experiments to demonstrate general purpose aerial service robotics capabilities. – Intensive Flight tests and integration. 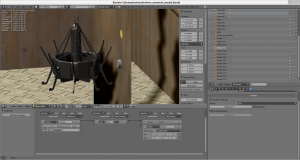 – New Sensor Rig Prototype (MV Bluefox CMOS Cameras (HDR), ADIS16375 Accelerometer & Gyros). – Plan Supervisor: Integration of path replanning, task replanning, and trajectory replanning. Plan/execution tests in a simulated environment considering task/path/trajectory plannig/replanning. 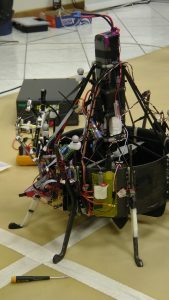 – Integration of the robot arm controller in the overall Software architecture. 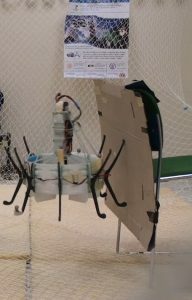 – Vision based haptic teleoperation of aerial vehicles for obstacle avoidance and target approach. – Preliminary integration with the task formulation engine. – Ground station. 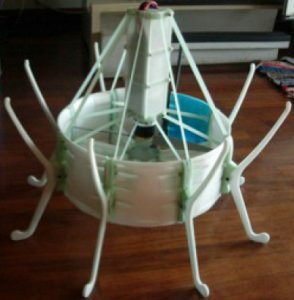 A ground station consisting of all the necessary equipments has been set up. Very preliminary flying experiments have been conducted Software integration of the complete system has been started. prepared a Linux (Ubuntu) RTAI installation for the Atom Board to execute the real-time code developed with the Linux Virtual Machine; first tentative class diagram and specifications of the basic low-level controller to be integrated with high level functionalities. Repulsive force for each obstacle point detected with in a sphere of a certain radius). 3. Merge previous clusters with current data. – Control Architecture (specification of task and path replanning protocols). – Task Planner (Definition of macro-action models (states and transitions); Specification of a simple user-interaction interface; Specification of task-replanning strategies; Implementation of a task decomposition system). – Path Planner (Definition and implementation of path replanning and recovery strategies; Specification of RRT path-planning parameters (variable tolerances) for the free flight mode). 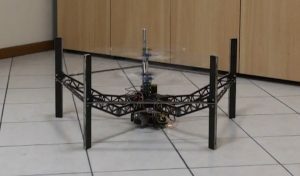 – The construction of the first prototype of the coaxial configuration has been completed and first flights have been carried out (see pictures below). First flight tests of the ducted-fan and coaxial aerial vehicles have been obtained showing how the framework succeeds in stabilizing the aerial vehicles using the feedback from the Optitrack camera system. During the first Integration Week the performances of the controller have been evaluated collecting several telemetry data. Preliminary flights in contact with the environment have been carried out (see picture below). – Mechanical design and construction. – The construction of the first prototype of the ducted-fan configuration has been completed (see picture). – Sensor fusion. 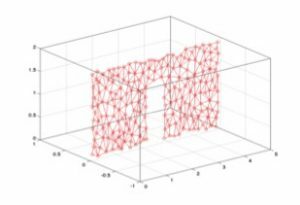 First algorithms for GPS/INS/Camera Fusion have been developed. – A C++ implementation on a real system is in progress. – Definition of operative scenarios. Industrial scenarios have been fully characterized (deliverable D2.2) and the main features of meaningful applicative fields have been extracted. A set of representative tasks has been identified and a representative mock-up environment has been sketched. – Laboratory set-ups and activities. preliminary estimation of delay / sample rate and precision of the cameras. 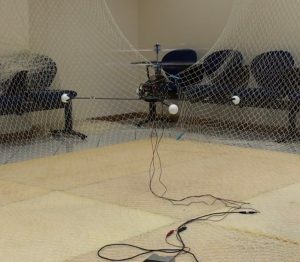 – For both the aerial configurations (ducted fan and coaxial rotorcraft) the first prototype design has been completed. 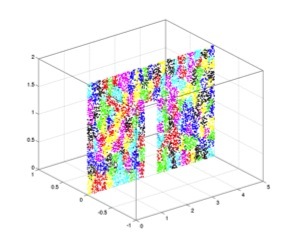 – FEM optimization of airframes: load cases defined by crashes and free flight with the objective of minimizing weight and maximizing robustness. – Construction of the prototypes is ongoing (stamps for fiberglass parts of the fuselage / structure). – An I/O concentrator based on Arduino MEGA has been finalized (first working version). – The high-level electronics has been further developed with integration of IMU & low-level sensor. – Laboratories set-up. All the partners set up dedicated lab facilities for the activities of the project. 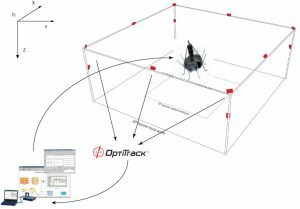 The Optitrack Camera System by Natural Point to assist real time tracking of the aerial vehicle have been also installed in a lab. – Electronics Development. Preliminary Hw/Sw development and integration have been achieved. 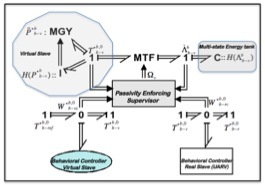 The overall Hw architecture has been structured on three layers: the low level, dedicated to basic inputs/outputs and sensors, the mid level, on which low level control and estimation algorithms can be implemented, and the higher level, meant to execute different high-level control tasks. – integration of a low-level communication based upon Zigbee 802.15.4 protocol within low-level and mid-level hardware. 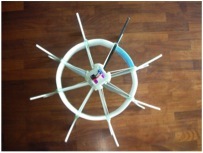 – design of custom boards to integrate the TMS within the first prototypes. High-level electronics. Possible high-level hardware architectures have been considered. In particular miniature boards based upon Atom Z processor which allows to run multi-tasking operative systems and to integrate high-bandwidth wireless communication. – Mechanics. A deep state-of-the-art about existing technologies and aerial configurations have been developed. Final industrial scenarios and benchmarks have been better characterized and detailed. Preliminary designs and sizing of the two aerial configurations have been done and first construction phases organized.